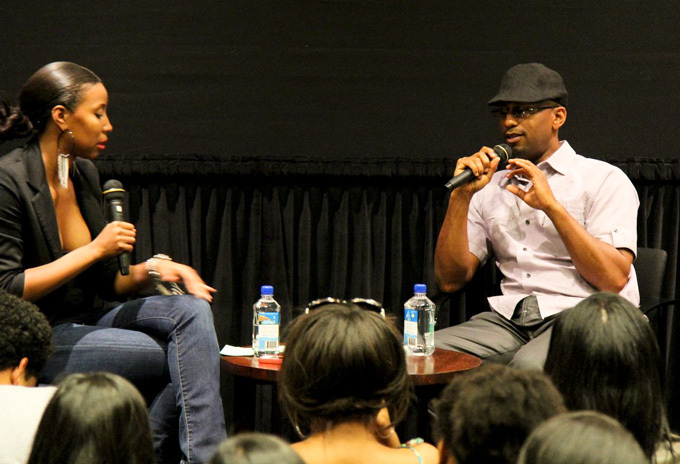 Alumnus Tim Story is known for his candor when he speaks to students at the USC School of Cinematic Arts. On April 17th, the director of Barbershop, Fantastic Four and Fantastic Four: Rise of the Silver Surfer visited with students in the Ray Stark Theatre for the second year in a row, following a screening of his new film Think Like a Man. In the Q and A, he was frank with students about the amount of work it takes to be a working director. The event was hosted by USC’s African American Cinema Society and moderated by Cachet Lamar, USC Production student and president of the organization. The African American Cinema Society (AACS) is a USC cinema organization, started by USC Alums acclaimed director John Singleton and David L. Watts. AACS encourages a support system within the cinema school, provides networking opportunities, and offers programming relevant to entertainment and the community. Story graduated from SCA in 1991. He went on to have a successful career directing music videos before making his feature film debut in 1997 with The Firing Squad. His widespread recognition came in 2002 with Barbershop.